Family Week in Provincetown is America's largest gathering of LGBT families. It's a week every summer in PTown when families that may look a bit different from some other families can gather and spend time with families that may look more like their own. Some of these families may have two daddies, or two mommies, or a number of kids from many different ethnic backgrounds adopted into one big happy family. Some of these families will have a combination of more than two parents while some will have a single parent. Click to visit the Family Equality Council website to find some very compelling videos and you'll see why this week is so very important to these families. Click to visit the 2012 Family Week page of Colage, (Children of Lesbians and Gays Everywhere) to find out a bit about Family Week events which they will be sponsoring. 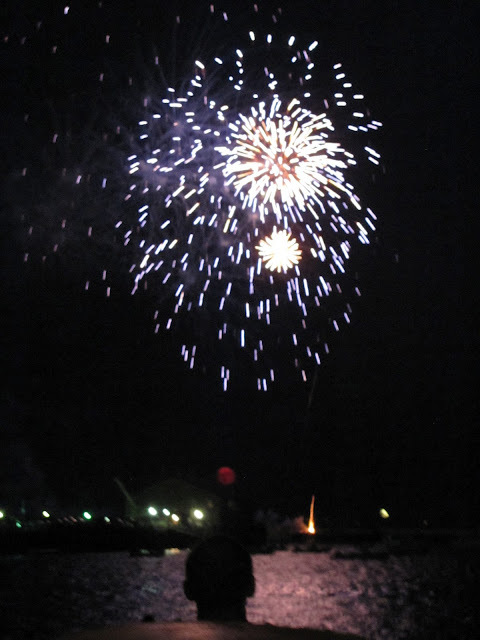 Click to visit the site for Provincetown for Women to see more about this event and its importance to these families. Information about Family Week events and activities can also be found at the old fire station on Commercial Street, right in the center of town, just west of Town Hall, which is found at 260 Commercial Street. This wonderful little girl and her family are here during family week. I think she told me her name is Emma, and they have come from the state of New York. 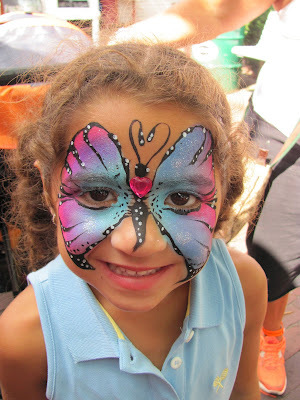 She had a butterfly painted on her face by Douglas Mason, who has been painting faces of kids and adults for about twenty years, and has worked on the streets of Provincetown for the last three summers. We had a conversation a couple of months ago about the awkwardness of the moment when a child wants to be painted as something that may make a parent a little uneasy. This typically happens when a little boy wants to have a butterfly painted on his face, or says he wants to be a fairy, and that is often when a very uncomfortable straight dad routinely goes into his ultra-macho mode and insists that his four-year-old will become a pirate instead. What a shame to crush the creative spirit of a child at such a very tender age. I beamed from ear to ear this morning when I saw a young girl with a Batman mask painted on her face, and I remarked about what a great Batman she made, and her parents smiled along with me. You've gotta love a town like this, where kids can dream and express themselves and be creative, and where they can feel at home in the world, whoever they might be. Their families can be just like any other family on the street for at least one week out of the year. Welcome to Provincetown, everyone, and happy Family Week! I don't know anywhere else in the world where you can take your dog into a public building like the post office or the bank and not only be welcomed in, but be fawned over and admired, and be offered a doggie treat to boot. Tellers at the drive-up window will ask how many dogs are in the car, so they can send out the correct number of dog cookies along with the driver's deposit receipt. In most any other place in the so-called civilized world, you would find this sign instead loudly proclaiming "No Dogs Allowed" in menacing, red, prohibitive lettering. In PTown dogs are lionized rather than villainized. 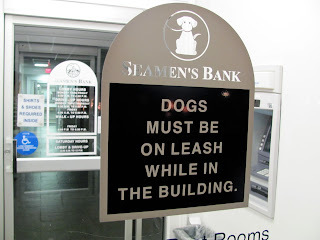 At Seamens Bank on Commercial Street, where this photo was taken, any dog that is tall enough to reach the counter is encouraged to stand up on its hind legs and accept a dog bone from an admiring teller. At my last inquiry I was told more than a quarter-million dollars had been privately raised for the Pilgrim Bark Park, the dog park out on Shank Painter Road. We now have a bubbler (a water fountain, for those of us born somewhere other than New England) on Commercial Street, in front of Town Hall, put there to provide a drink for dogs walking by with their humans, with the fountains included for watering the humans being its secondary purpose. Many shopkeepers set out a bowl of fresh water for passing dogs and keep dog treats handy, and all of this prompted Dog Fancy magazine in 2010 to name Provincetown the Most dog-friendly of their top 40 cities and towns. 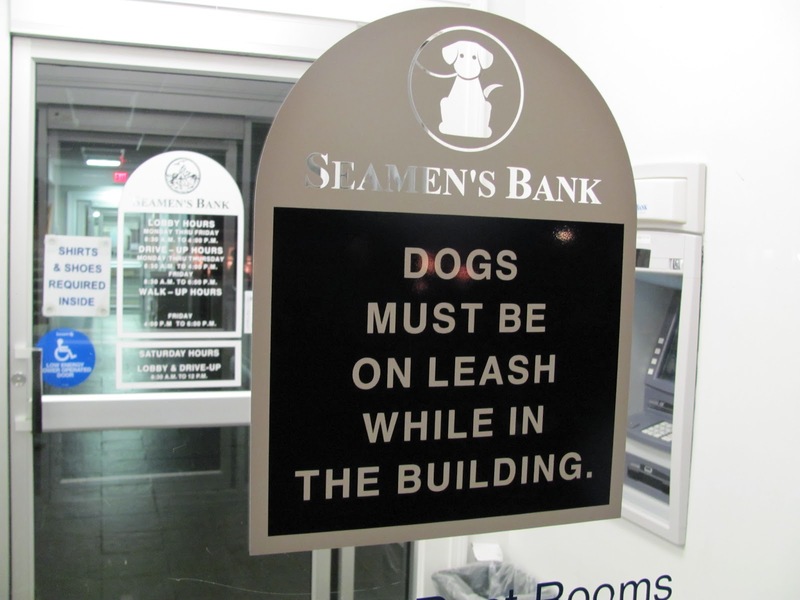 Dog Fancy editor Ernie Slone said: "All dog owners know of a few local shops or restaurants that allow dogs, but it is remarkable to have an entire town where virtually every establishment opens its doors to dogs - even the bank." Click on this link to find a Provincetown Business Guild article all about bringing your dog to Provincetown. On my quest to help you eat well, with three meals a day for under $35 total for the day, this is my second entry into the pool of meals that you can quite easily combine to come up with an excellent line-up of nourishing, tasty, filling, high quality, well prepared yet very inexpensive PTown meals. At Red Eye Coffee, at 258 Commercial Street, just west of Town Hall, Jeremy is now cooking up a full breakfast on Saturdays and Sundays, and you can order this terrific meal all day long. Order two eggs cooked however you like them, and a choice of ham, bacon or sausage, served with home fried potatoes and your choice of Texas toast, Portuguese muffin or bagel, toasted and buttered, for $6, which includes the tax. I ordered sausage, an "everything" bagel, and eggs over medium. Everything was cooled perfectly, the home fries were delicious, and the plate came garnished with a few slices of fresh cantaloupe. I haven't found anywhere in town where you can beat this breakfast and its price. Order it right through the day until closing late at night. I had it at breakfast time, sitting at a table on their patio out front, watching the people go by on Commercial Street. If you stop by on a day other than Saturday or Sunday, you won't find this breakfast, but you will find a wide variety of fresh baked pastries, turnovers both sweet and savory, individual quiche and many other items suitable for breakfast and also in the range of around $6 or less. Today I noticed there was a spinach quiche, and a bacon quiche, and the other day I wanted to try the cauliflower quiche but it sold out before I got one. Ham and cheese turnovers, blueberry turnovers and many other pastries are generally available along with a breakfast egg-and-cheese sandwich. Those are $4.50, or add a breakfast meat for another dollar. 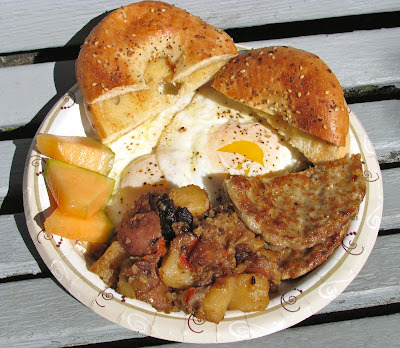 So there are many meals and combinations here that fit into the Provincetown 3 under 35 list, but the most outstanding bargain is the weekend breakfast plate for just 6 bucks, and that makes it a Best Bite. You can't beat it. Update: A few days after I wrote this post, the summer season picked up a bit, and Jeremy began offering this meal every day. Let's hope that lasts beyond Labor Day when the crowds thin out again. 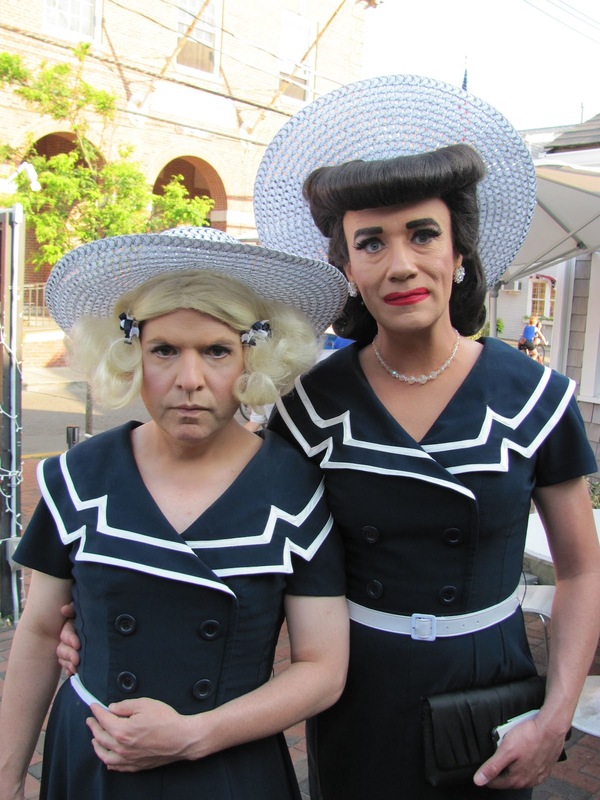 Jamie Morris has brought back to Ptown his comedy parody of Faye Dunaway's accidental parody (in the film Mommie Dearest) of the tell-all book about the stormy relationship between screen legend Joan Crawford and her adopted daughter, Christina, written by Christina after Crawford's death. Morris is brilliant in his way-over-the-top performance spoofing Dunaway's famously over-the-top portrayal of the aging Joan Crawford in the film that has become something of a cult classic over the past thirty years. But Morris takes us a step further into the ozone in this very clever play by supposing that Crawford may have actually been a man underneath all that lipstick and big hair. Brooks Braselman turns in a splendid performance as the long-suffering yet quite bratty Christina, subjected to various emotional and physical assaults by the more-than-compulsive Crawford. Who can forget the infamous movie sequence revolving around the clothes closet and the forbidden wire hangers? Or Crawford's triumph, and definitive utterance, at the board meeting of the cola company? As you might guess this play takes these scenes well beyond the level of the film, with hilarious results. Here's a link to a YouTube teaser of Mommie Queerest. The play, with its spectacular array of picture-perfect costumes, is in production at the Art House, at 214 Commercial Street, on Tuesday, Wednesday, Saturday and Sunday nights through Saturday, September 1st. See it tomorrow, July 28th at 9 PM; Sunday, July 29th at 9:30 PM; Tuesday, July 31st and Wednesday, August 1st at 7:30 PM. All other shows through September 1st will be at 10 PM. Click this link to get tickets online or visit the box office, no longer found on the patio but now inside, near the bar, where you can also get a drink to take into the theater with you, which is highly recommended for this show. 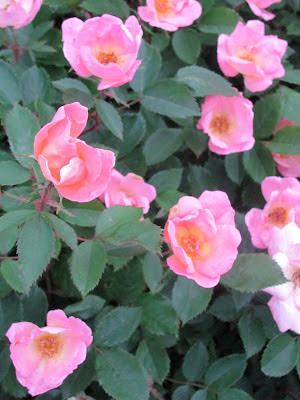 Rosa Rugosa, sometimes called beach rose or any number of other names, blooms along the shoreline of Provincetown beginning in the spring, often having a second blooming around mid-July, and sometimes even a third round of blossoms before it begins to die off for the season in the Autumn. It is found in great abundance on the fore dune (the first small sandy hillside along the edge of the water) at Herring Cove Beach and in a number of spots out in the dunes. It withstands the salt spray of the ocean very well, and it is often the first plant in from the edge of the beach able to thrive along the salty shoreline. When Hurricane Bob and the no-name storm that followed damaged the old wharf at the Ice House in the east end of town in 1991, and subsequent storms broke off other small pieces, the old wharf eventually had to be removed. The gaping hole left in the seawall after the removal of the pilings and planks was filled in with a mound of sand running the length of the gap, and rose hips were planted in the sand, where they are sometimes splashed with sea water during a windy high tide, and yet they thrive there. 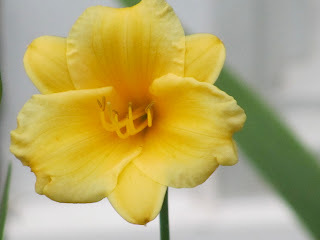 When the petals drop off, a sort of fruit begins to form, turning a deep orange to a bright red color and looking a bit like a cherry tomato by the end of the summer. This fruit is rose hips, and not a tomato by any means. Rose hips jam, jelly and marmalade are popular around the world, but if you want to try this fruit right off the bush, take care to avoid the tiny hairs that grow inside. They are used to make itching powder. The national soft drink of Slovenia is Cockta, a sort of fruity beverage made from rose hips. In Hungary an alcoholic beverage called Palinka is made from rose hips. It also has a great amount of vitamin C, and if you read the label on your bottle of vitamin C at home, you'll very likely find rose hips as a major ingredient. Native to southeast Asia, this plant has been cultivated in China and Japan for over a thousand years, where the fragrant, sweet-scented blossoms are used to make a potpourri. In the early seafaring days of Provincetown, rose hips were commonly taken on board on long sea voyages where the sailors and fishermen would often be away from shore for months at a time. Typically the Grand Banks Schooners would set sail in April for the rich fishing grounds found off the southeast shores of Newfoundland. The Grand Banks were some of the richest fishing grounds in the world. The fishermen would stay until the end of summer, in September, and return with the holds of their ships filled to the brim with cod and other fish that would bring a good price. In the first few weeks of the voyage, they would eat up all the fresh fruits and vegetables they could carry on the ship. After that they would still eat fairly well. 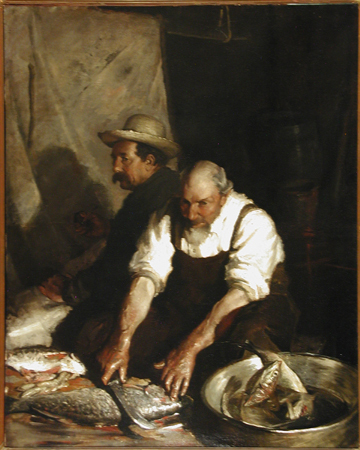 They had fish, of course, available every day, and whatever else they might catch by chance, and likely cured or dried meat such as ham or venison jerky, and the ship's cook would make them fresh biscuits every day, but there is no vitamin C in any of those foods, and without it, scurvy would make the men quite ill. So they would have rose hips tea or rose hips jelly for the vitamin C they needed to stay relatively healthy on a long sea voyage. Look for rose hips jelly in some of our local shops and markets, and think about the hundreds of local fishermen and sailors who depended on its health benefits during the early fishing days in Provincetown. 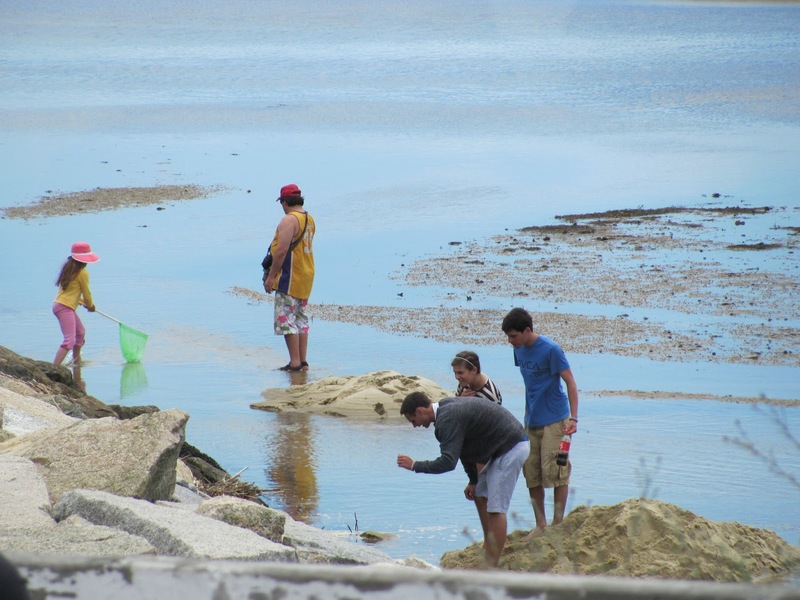 The Provincetown Center for Coastal Studies has scheduled their second annual week-long celebration of the abundant marine wildlife that's found in the waters surrounding Provincetown. All events have a marine theme, are family-friendly, and most events are free. Today, July 25th, there's a special puppet and live action theater program for kids at Provincetown Town Hall, at 260 Commercial Street, at 11 AM and 4 PM. This program will tell the story of Ibis, the first whale ever to be disentangled by the Provincetown Center for Coastal Studies many years ago. Scientists from the center know these whales so well that they know many of them by name, and will give a name to a new whale when they encounter one they've never met before. A catalog of photos and notes on these whales is kept, and now scientists around the world can recognize these whales and know them by name, adding more notes to the file when they find these whales in other waters far from Provincetown shores. Thursday, July 26th, there will be a lecture on whales of Cape Cod at 11 AM at the Provincelands Visitor Center, located on Race Point Road. There's also a workshop on landscape photography Thursday evening at the same venue at 6 PM. 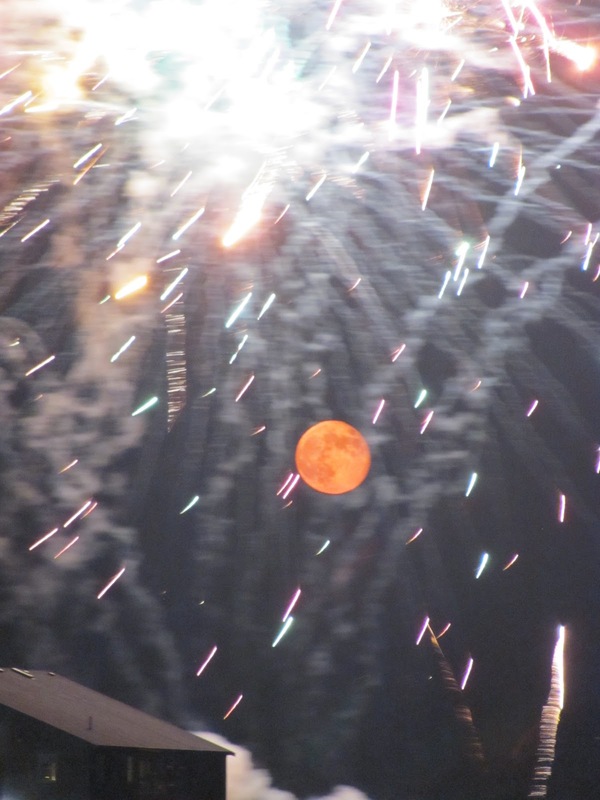 Bring a camera, tripod, and your photographic eye. Reservations required. Call PCCS at 508-487-3623 x 103 to register. Both of these are free events. On Friday, July 27th, at the Bas Relief Park on Bradford Street, behind Town Hall, there will be Whale Olympics, arts and crafts, fun and games for the whole family, beginning at 10 AM. This is also a free event. 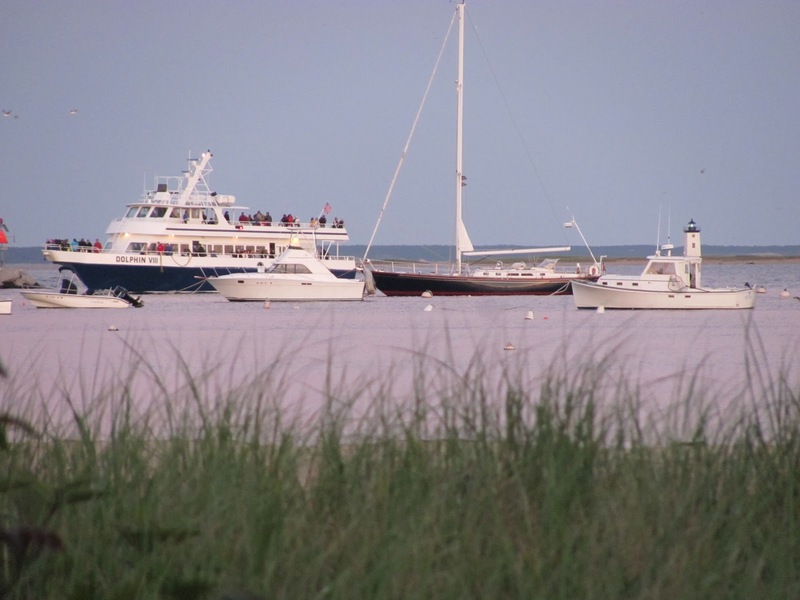 Friday, July 27th, there will be a Sunset Whale Watch Cruise with Provincetown Center for Coastal Studies. Meet at MacMillan Pier. Departure is at 5 PM. Take this Cruise with PCCS scientists aboard the Dolphin Fleet Whale Watch vessel. Learn about whales from the scientists that have been studying them for 35 years. This is a benefit for PCCS research, rescue and education programs. There will be a picnic supper along with beer and wine. For details contact Jesse Mechling at 508-487-3623 x 103 or email jmechling@coastalstudies.org. For more information about Whale Week, you can visit www.coastalstudies.org or call Jesse Mechling at 508-487-3623 x103. A full calendar of events is also available on the Center's Facebook page -www.facebook.com/coastalstudies. Old postcards like this one, presumed to be set somewhere in the 1940s, take us back to an earlier day in Provincetown, with many of folks here able to remember days gone by when there were a number of wharves along the waterfront. During this period in our history there were grocery stores on Commercial Street, a couple of them at the corner of Commercial and Standish, where the Lily Pond and the Governor Bradford stand today. There were quite a few schools around the town and dozens of kids could be found on the streets in any given neighborhood, and another dozen down on the wharves any day of the week in the summertime, diving into the water after the coins tossed into the harbor by tourists. In those days Commercial Street was a two-way street, with traffic moving in both directions, and with parking allowed! The title at the top of this postcard calls it a "quaint harbor scene" of Provincetown. I've found a number of these old postcards on the Internet, and I sometimes buy them when they turn up on eBay or in other spots at a reasonable price. I'll share more of these in future posts about the history of the town. If you have a collection of your own, I'd love to show some of them here, and I'd love to hear about anyone else's recollections of PTown in days gone by. The harbor and the bay ore both steps away, and the water is fine. Why not rent a kayak, pack a lunch and head out to Long Point to spend the afternoon? In a couple of spots in town, you can rent a two-person, sit-on-top kayak for as little as $50 for four hours. With a little bit of instruction, just about anybody can quickly learn to handle a kayak and get out and enjoy this beautiful weather we're having. Find Venture Athletics Kayak Rental on their Facebook page, or stop by at 237 Commercial Street, inside the Whalers Wharf, on the right, just past the rotunda as you head toward Provincetown Harbor by walking through the building. 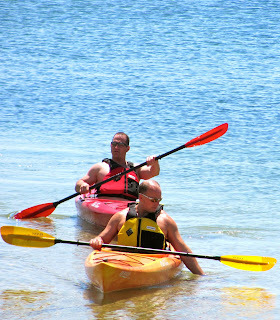 Call them at 508 487-9442 to reserve a kayak or to find out more. They do a full moon guided tour in the harbor and out into the bay. Other tours are available as well. Take a trip with a naturalist who can tell you about marine wildlife you may encounter along the way. They also have a beach shop where you'll find hats, sunglasses, snorkeling gear, life vests, suntan lotion, or anything else to help you get out to enjoy the water. You can also rent a kayak at Flyer's Boat Rental, found at 131A Commercial Street, Which is actually tucked away down a little West End alley called Good Templar Place, next to Lorraine"s restaurant. Flyer's rents one or two person kayaks, as well as power boats or sailboats. Their experienced crew can tell you about the best places in the harbor to paddle through or areas to fish. Call 508 487-0898 to reserve a boat or kayak. I was having a salad at Twist'd Sisters one day while I was writing a post for this blog and I heard someone order a sandwich. They had never had sandwiches on the menu before, so I determined to come back soon to try them. I went back another day and told Devon that I had come to try a sandwich, and I asked him what I was going to have. He thought for a second and told me I would have the Italian. They call it a Broadway. It's made with ham, mortadella, salami, provolone, red peppers, black olives, lettuce, tomato, pickles, onion and an herbed vinegar and oil dressing. It was huge, like an Italian sandwich with a side salad added in. It was served open-faced, because you probably couldn't get the top half to fold over the bottom half and stay put. This sandwich barely fits on the plate. Once I got the top half folded over (and it took both hands to hold one half of this sandwich together) and took a couple of bites, I couldn't put it down for fear it would explode. And I didn't want to put it down anyway, because it was a great sandwich. All the veggies and garnishes worked really well together with the meat and cheese, and the dressing was perfect. I took quite a while to eat it, clutching together half of the sandwich at a time. 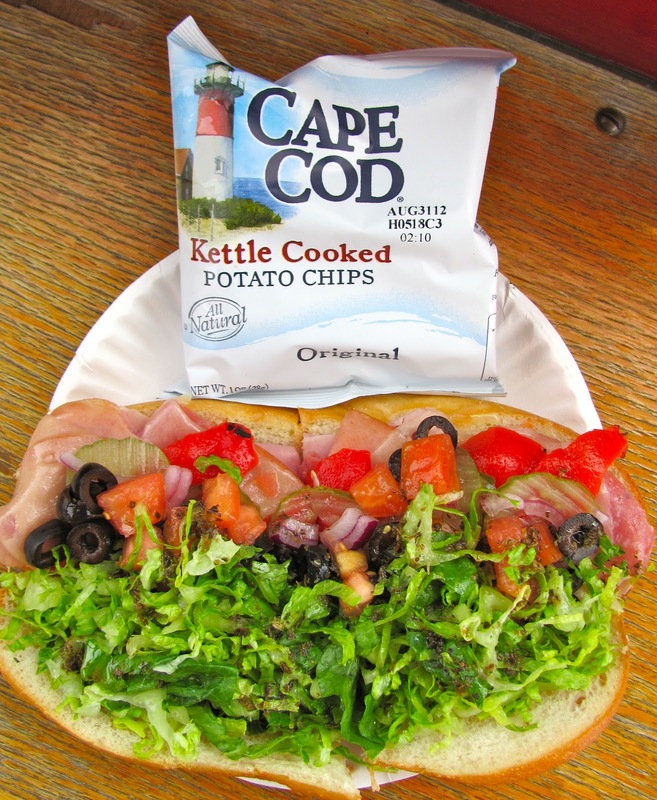 Sandwiches come with a bag of Cape Cod potato chips, too. Click this link to find the Twist'd Sister menu. You can print yourself a coupon from their website I want to try the Harlem sandwich next. It's made with roast beef, bacon, melted cheddar cheese, lettuce, tomato, red onion and BBQ sauce. I'll have to make sure I'm really hungry first. There are 7 choices including a vegetarian option, and there's a build-your-own where you choose a meat and a cheese and your own list of condiments, garnishes and dressings from a list of 15 choices. Of course, you can get New York style pizza, salads, chicken wings or hero rolls, which are a bit like a calzone, with pizza dough wrapped around veggies, a chicken cutlet, cheese steak or meatball parmigiana, which is my favorite. Ask for a side of extra tomato sauce to dip it in. Now serving beer and wine. And, of course, ice cream for dessert. Visit Twist'd Sisters at 293 Commercial Street, or call 508 487-NYPD (just remember New York Pizza Delivery, or dial 6973) to pick up, or have your order delivered from noon till midnight. Open 11 AM till 2 PM in season. Key Words: Food, Ice Cream, Pizza, Restaurants, Sandwiches, Vegetarian, What's New? As I was having my own dinner on the patio, next to the waterfront deck at the Aquarium Marktplace, I met these folks from Truro. 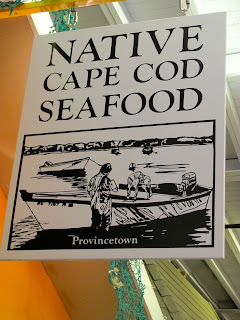 They quite often come into PTown for supper and have a number of favorite meals in our local eateries. This night they came into Provincetown for Chinese and fries. They got Chinese take-out from the Fortune Cookie, a Townie Favorite and the longest-running restaurant in the food court at the old aquarium, now in its 20th season serving appetizers, seafood dishes, beef, chicken and vegan choices, along with many others. Among my favorites are the Scallion Pancakes, Thai Chicken Wings, and General Tsao's Chicken; a daily special and a real bargain at $11.55, and that includes the tax. One of my favorite vegetarian dishes here is the Tofu and Broccoli. You'll also find Connie's Bakery in the Aquarium, with egg sandwiches and a variety of breakfast pastries from scratch every day, and a savory pastry called a street pie, meant to be eaten as you walk down Commercial Street. This foursome from Truro also ordered a big basket of fries from Batata, which features a wide variety of Canadian-style comfort foods, among them some of the town's best French fries, as well as a favorite take-out menu for a number of local police officers, making this little spot another Townie Favorite. These folks from Truro sat down at the table next to mine as I was trying the fish taco of the day from Native Cape Cod Seafood. They've really hit their stride this year, now in their 2nd season in the Aquarium Marketplace. Give them a try. A man sharing my communal table was there for the Lobster Scampi served over linguine. He told me he thought it was one of the best values in town on top quality seafood. New this year in the Aquarium is Cookies U, featuring delicious cookies made from scratch every day by Jackie, a former teacher, now following her heart and baking up cookies from simple to elaborate every day. A favorite of mine is the basic peanut butter cookie, in the Cookies 101 section. Cookies with something extra, like Jackie's frosted sugar cookie, are in the Cookies 201 class. Advanced studies in the Cookies 301 class include whoopee pies and others that have moved well beyond basic studies. Stop and taste these cookies and you will return again. That brings us to Big Daddy's Burritos, where meat lovers and vegetarians alike will find fresh, healthy choices in not only burritos, but also tacos, nachos, quesadillas, and salads, and any burrito can be served in a bowl without a tortilla and gluten free. One of my favorites here is the Squash and Corn Burrito, made with zucchini, corn, brown rice, Monterrey Jack cheese, your choice of black or pinto beans and homemade salsa, all rolled into a 12 inch flour tortilla. You can also add sour cream, or make it a whole wheat or a spinach tortilla for a small extra fee. I also like the Carnitas Burrito, made with specially seasoned, slow-roasted pork. Add $1.25 to any food purchase and get a 24 ounce freshly brewed iced tea. Get a breakfast burrito from 9:30 till 11 AM. There is no better spot in town for dessert than I Dream of Gelato, with dozens of things here each qualifying as a Best Bite. It's the last shop on the left as you walk through the building and out to the beautiful waterfront deck looking out over the boats in the harbor. 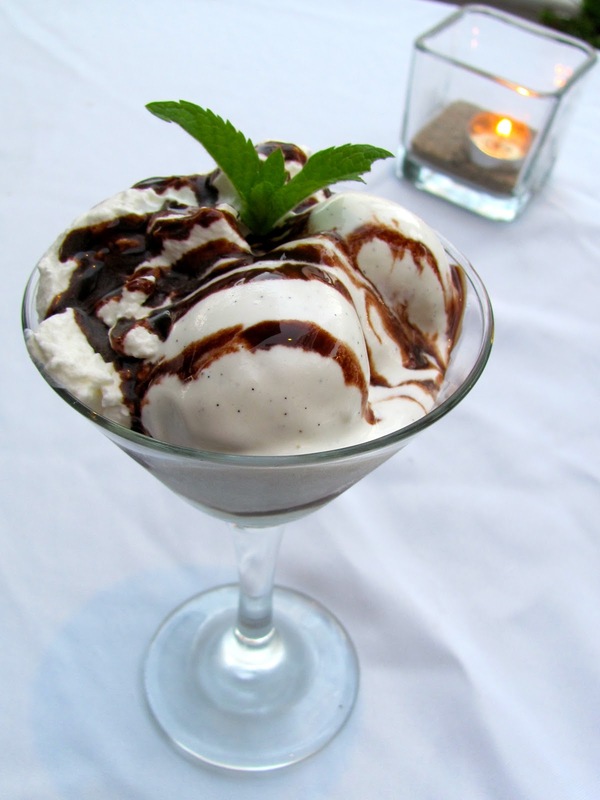 Homemade gelato, the Italian ice cream, is made right here, all day long, with more than 160 flavors having been absolutely perfected over the years. Gelato is not only better for you, but it also has more flavor than traditional American ice cream. Made with milk rather than heavy cream, and without eggs, and frozen at a slightly warmer temperature and with much less air whipped into the mixture, the result is an extremely flavorful, denser and smoother consistency that really lets the flavors of the fruits, nuts, caramel swirls or whatever special ingredients might be in your favorite flavor shine through. There are always 24 flavors in the case, each of the 160 flavors taking its turn in the spotlight. You'll find traditional favorites like strawberry, nearly three-dozen chocolate flavors, and unique offerings like the golden butter cake with milk chocolate frosting. The black sesame is simply amazing. My very favorite is the pineapple basil sorbet. Like all sorbets, it is made without any dairy ingredients, so it is even lower in fat and calories, but you could never tell from the taste. There are sugar-free choices as well. Try any flavor and you'll be hooked. Tastes are available. This shop also makes wonderful specialty coffees, Italian hot chocolate and other treats, too. Look for an upcoming post about I Dream of Gelato. 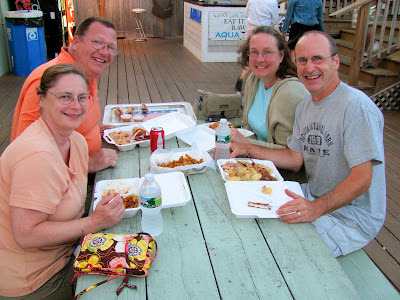 Choose your food, even from more than one of these restaurants, as these folks from Truro did, and carry it out to the patio or the waterfront deck to enjoy a little sea breeze, and get a few oysters on-the-half-shell or other treats from the raw bar on the patio. Have a cocktail from the Aqua Bar, right on the deck, served by Dante, one of the town's favorite bartenders. The view from the deck is fantastic, and you are having your own, custom waterfront dining at a bargain price. Meals here range from about $7 to $20, with many around the $10 range. The Aquarium Marketplace is found at 205 Commercial Street, near the corner of Carver Street. It was 50 years ago, in the summer of 1962, that Abstract Expressionist painter Robert Motherwell began spending his summers in Provincetown. He was inspired by what he saw around him that summer while he was living in this little spit of sand at the tip of Cape Cod. 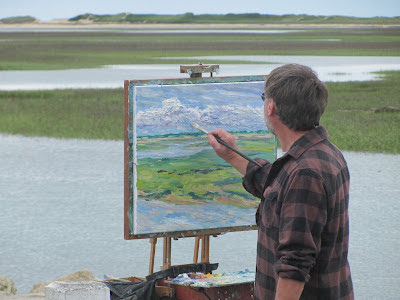 The power of the waves crashing onto the shoreline made an impression on him, and from his Commercial Street studio in Provincetown he begin his "Beside the Sea" series, which eventually numbered 64 paintings in total. With all his strength he splattered oil paint on rag paper, mimicking the waves pounding against the bulkhead in front of his studio. 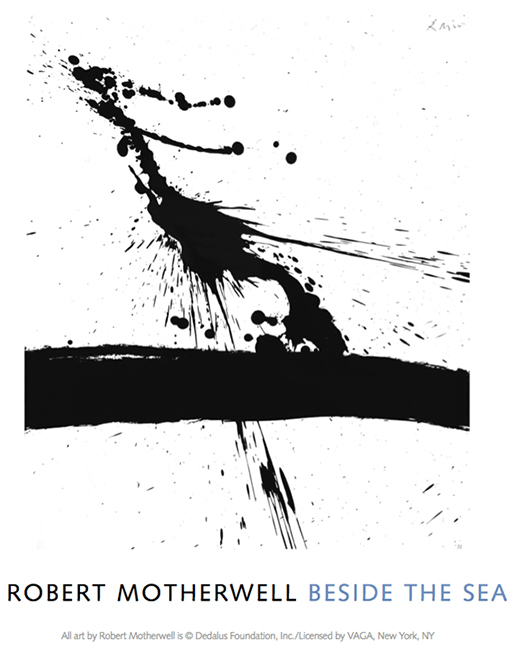 When several sheets of this heavy paper split under the force of his arm, Motherwell began using a heavier paper that had been specially reinforced. Motherwell established the Dedalus Foundation to foster the ideas of the Modernist movement and to increase public awareness and understanding of modern art. He is considered by many to be the best of the Abstract Expressionist painters, with works in major collections and galleries around the world. Click the following link to see over 300 works by Robert Motherwell. Provincetown Art Association and Museum is mounting an exciting exhibition of rare works created in the artist’s Provincetown studio from its inception that summer in 1962 until his death here in 1991. Robert Motherwell: Beside the Sea, curated by Lise Motherwell and Dan Rinalli, runs through September 30th, with an opening reception tonight, July 20th, from 8 until 10 PM. 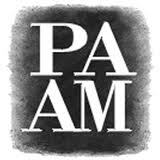 PAAM will be closed to the public this evening from 6 till 8 PM for a private event. Robert Motherwell was also among the founders of the Long Point Gallery in 1977, and some of his work there can be seen at PAAM through September 2nd, along with the works of many other important artists from the legendary Long Point Gallery, in a show entitled Long Point: An Artist's Place, curated by Mary E. Abell, Ph.D.
PAAM is located at 460 Commercial Street, open daily in season, with hours varying by day and season. Phone 508 487-1750 or check their website at www.paam.org to keep up with all the events at PAAM. Admission is $7 with free admission on Friday evenings. PAAM members and children 12 and under are always admitted free of charge. 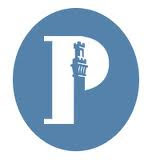 The Pilgrim Monument and Provincetown Museum hosts a free magic show for kids tomorrow at 1 PM. Along with this fun entertainment, families (and the rest of us, too) will be treated to free admission to the monument and to the museum as well. So plan to spend some time after the magic show exploring the exhibits in the museum. You'll find things like a scale model of the Mayflower, a diorama of the signing of the Mayflower Compact, a cut-away look into the quarters of a ship's captain of the 1700s and many more wonderful exhibits. You'll also have a chance to climb to the top of the Pilgrim Monument, the tallest all-granite structure in the United States. Take your camera with you. The view over Provincetown Harbor and the surrounding area is terrific. On a clear day, from the top of the monument you can see for miles and miles in all directions. It takes the average person about ten minutes to climb to the top, just over 252 feet above the top of the hill, and 350 feet above the harbor. Take advantage of this chance for free admission to PMPM, and some good fun for the whole family. Walk up High Pole Hill or up Winslow Street, off of Bradford Street behind Town Hall, or find paid parking up Winslow Street at the base of the Pilgrim Monument. If you are just lucky enough to find a legal parking space on the street somewhere in Provincetown, pull to the end of the space so someone else can park, too. If the white car had parked with its rear bumper lined up with the yellow line behind it, and if the car in front of it had pulled up to the edge of the "no parking zone" marked with yellow paint on the curb ahead of it, there would have been room to park another car between the two of them. Parking an extra car may not seem like much, but when this waste of a space happens in dozens of spots all over town every day, it adds up to the loss of a tremendous number of very valuable free parking spaces each day. 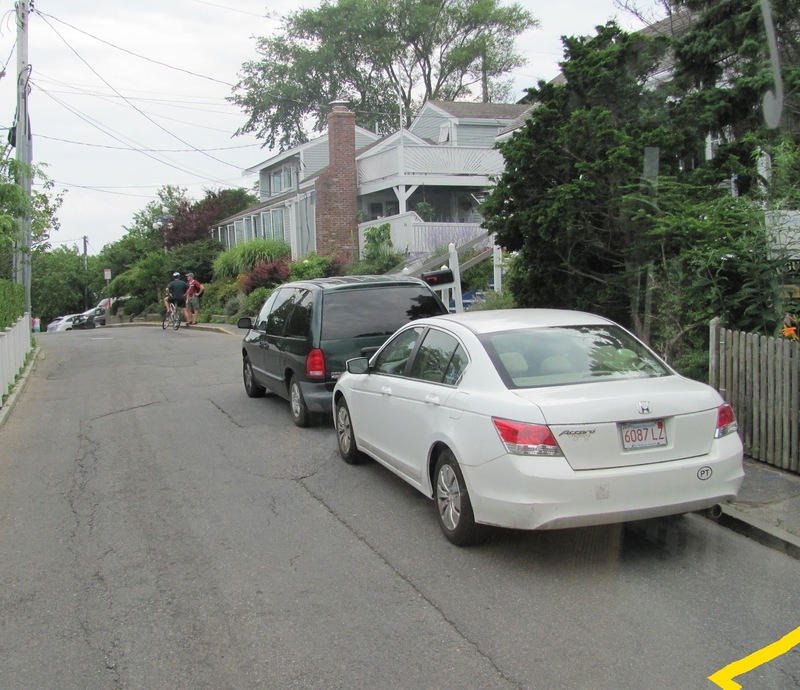 These cars were parked this way for nearly a week, so this neighborhood lost that extra parking space for a considerable time. Please be mindful of others, and be considerate when parking your car. When you park smack in the middle of a parking space meant for more than one car you are wasting parking spaces, and you're blowing your own parking karma. The CapeCod National Seashore Sponsors many events and activities led by the Park Rangers every week in the summertime. You could take a dune walk, learn to snorkel, look for seals hauled out on a remote beach, go kayaking, explore the tidal flats, or enjoy any number of other great activities. On Tuesday nights at the Salt Pond Visitor Center in Eastham, the Rangers give talks on many topics including marine wildlife, birds of prey, local characters and many more subjects. They are often joined by storytellers, musicians and many others. Coming up on Tuesday, JULY 31st, a program entitled "OR WOULD YOU RATHER BE A FISH?" promises an evening of family fun complete with song, dance, and audience participation. Join minstrel storyteller Mary Jo Maichack for this program of folklore and songs of the sea. All programs begin at 7 PM but space is limited and doors open at 6:30, so you want to go a little early. Programs typically run about an hour. Free parking is readily available, but the Flex Bus stops at the visitor center on the hour till 8 PM and heads back toward PTown at forty-five minutes past the hour till 9:45 PM, so you may be able to leave the car behind. 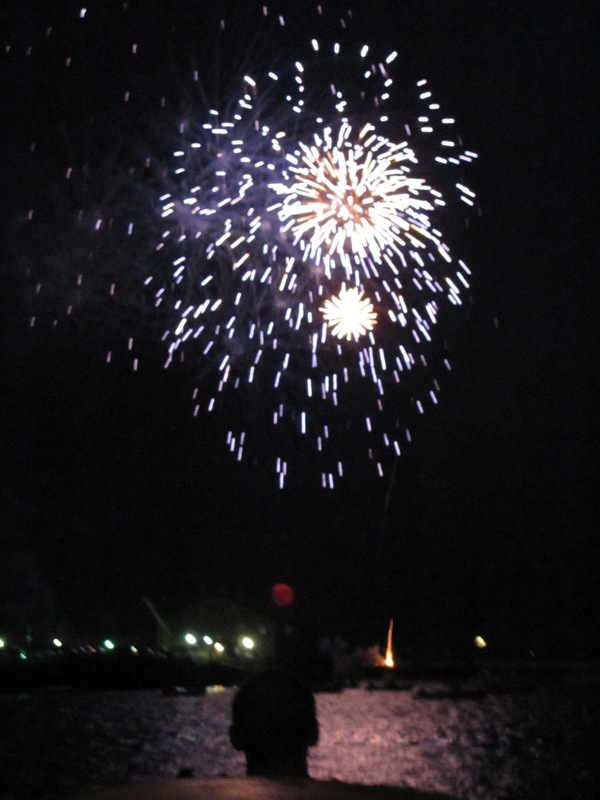 Call the Salt Pond Visitor Center at 508-255-3421 to see how late they will stay open after the program. 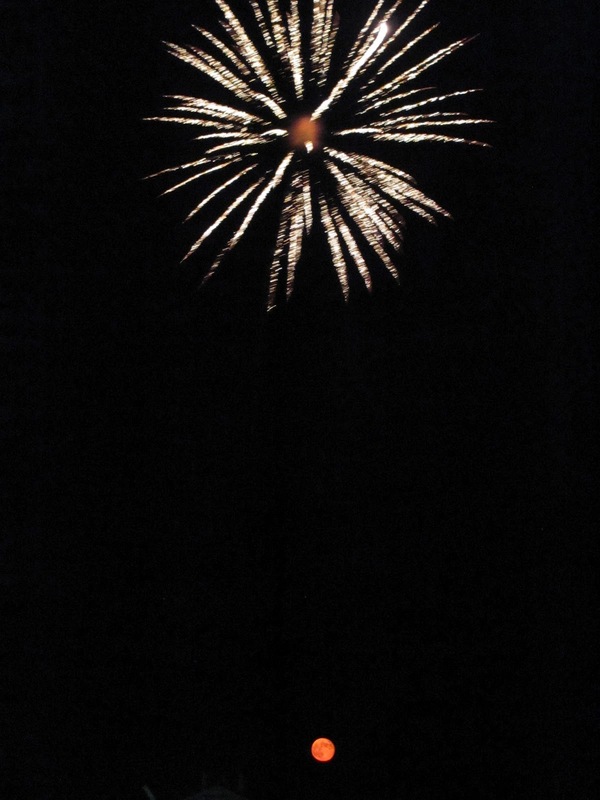 WALK: NIGHT PATROL AT OLD HARBOR - 1 1⁄2 hours, 1⁄4 mile. Free. The heroic surfmen of the U.S. Lifesaving Service were always ready for a rescue, especially at night. Experience the station and the beach at night as if it were the early 1900s. Hear stories about shipwrecks and those who inhabited the station. Meet at Old Harbor Life-Saving Station, Race Point Beach. Saturdays at 7:30 PM. WALK: TIDAL FLATS FORAY - 1 1⁄2 hours, 1⁄2 mile. Free. 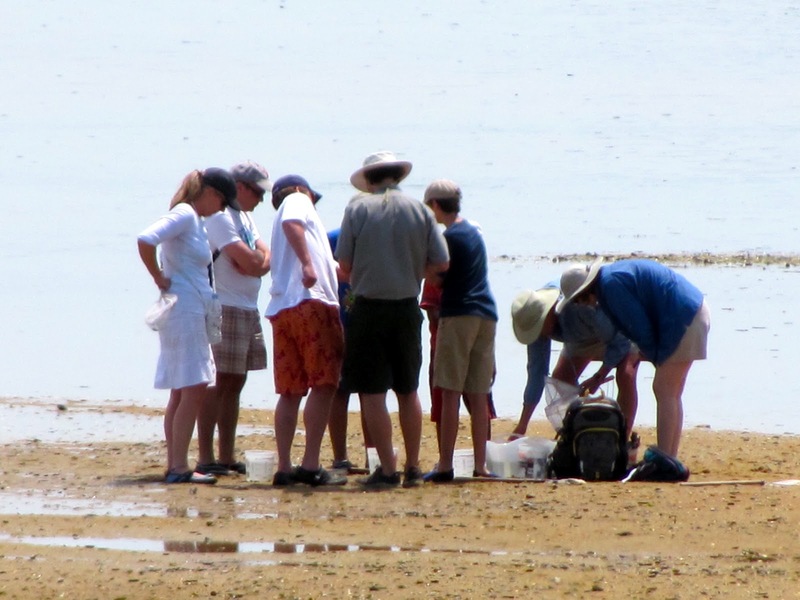 Get your feet wet as you explore the abundance and diversity of life in an intertidal zone in Provincetown. Mondays and Wednesdays in July, times vary. CANOE ADVENTURE: LONG POINT - up to 3 hours, 3 miles. Fee required. Paddle across Provincetown Harbor to explore marsh, tidal flats, and dunes. Learn about the interesting history of Long Point. If conditions permit, swimming and snorkeling may be possible. Fridays at varying times. call Province Lands Visitor Center, 508-487-1256 for more information. ACTIVITY: SEAL PUP STORIES - 1⁄2 hour. Free. Where are seals born, and what do they need while growing up? Join a naturalist for an indoor program about seals, including short activities and a story, geared toward ages 3 to 8. Parents must remain with children. Meet at Province Lands Visitor Center, Thursdays at 4 PM. HIKE: ART IN THE DUNES - 3 hours, 2 1⁄2 to 3 miles in loose sand. Free. On this long hike into the Province Lands dunes, view firsthand the quality of light, natural environment, and isolation that have long attracted artists and writers to Provincetown. Meet an artist-in-residence at a dune shack. Reservation required. Tuesdays at 4 PM. CAMPFIRE: HERRING COVE BEACH - 1 hour. Free. Enjoy sunset on the beach and an evening of folklore and games around the campfire. At some programs, campfires will include sing-along programs sponsored by Friends of the Cape Cod National Seashore, with special guests Denya LeVine, Randy Patterson and Tim Dickey. Bring a beach chair or towel to sit on. Meet the rangers at the end of the right-hand parking area at Herring Cove Beach, Provincetown. * Accessible with assistance if Province Lands Visitor Center is notified in advance, 508-487-1256. Fridays at 7:30 PM in July, at 7 PM in August. 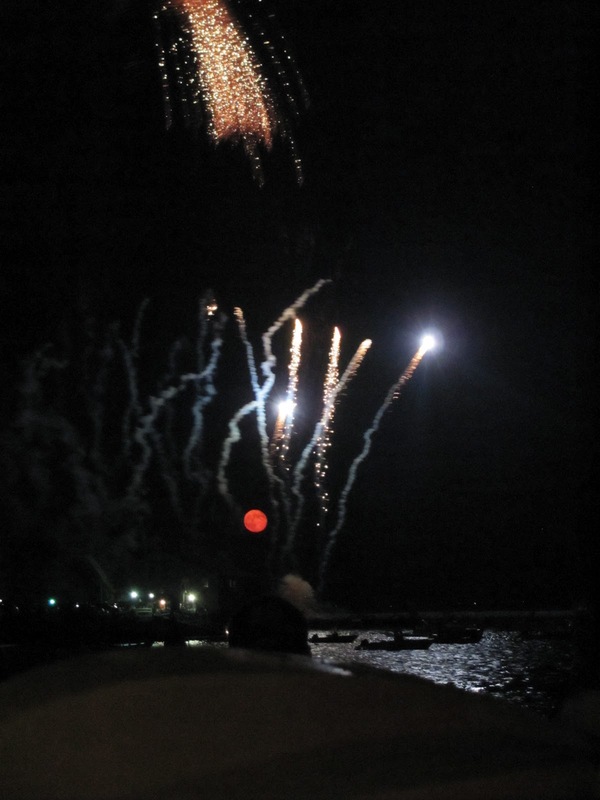 Click this link for a list of CCNS Ranger-Led Activities and scroll down to the Provincetown section. Truro, just south of Provincetown, also has a number of interesting programs listed in their slot on this same schedule. For more info or for reservations phone the Province Lands Visitor Center at 508-487-1256. It just wouldn't be summer in Provincetown without a little Poppy, and all we get this summer is a little: just two nights of her rapid-fire, no-holds barred, flat out funny stand up comedy. Poppy hasn't missed a summer in Provincetown in ten years, but this summer she has only two days here, performing in her irreverent, outrageous style, tonight and tomorrow only, so don't miss her. Although Poppy is based in Los Angeles, she appears all over the country, and has been performing in Titanic: The Musical at the Courthouse Center for the Arts in Kingston, Rhode Island. She was able to slip away for a couple of days to bring her very quick wit and her versatile improv style to Sage, July 16th and 17th at 7:30 PM. Sage, formerly Vixen, is up the alley at 336 Commercial Street. The new owners have redone the place, and seeing Poppy is a good reason for me to go and check out the new digs. I was lucky enough to run into Poppy last night on Commercial Street, where she was joking with the crowd and handing out flyers for her show, otherwise I might have missed her only two shows of the summer. 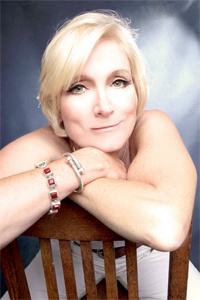 You can bet I'll be at Sage tonight to see one of PTown's favorite comics do her stuff. A couple of weeks ago all the pedicab drivers in Provincetown began bulking up, carbo-loading, doing calisthenics and leg presses at the local gyms, getting ready for Bear Week, the yearly event that brings hundreds upon hundreds of Bears to Provincetown to meet and socialize with other men like themselves. The New York Times has referred to them as a "subculture of gay men known as bears, who embrace natural body hair." Many are of considerable stature as well. Click this link to learn more about Bear Culture. Bears are encouraged to register upon arrival in Provincetown, and that will provide them with dog tags that can be shown at many spots in town to receive discounts on meals, merchandise and other things at many, many participating restaurants and shops. There are also specials offered without the requirement of a tag, and many fun celebrations, in small ways, are part of this event that our town embraces every year. Look for things like special Bear Week meals at the Seafood Grille at the Waterford Inn, with an all-you-can-eat Fish and Chips dinner for just $18, among other meal deals celebrating this event. Sals restaurant is offering a five-course Bear meal or a three-course Cub meal at special prices. 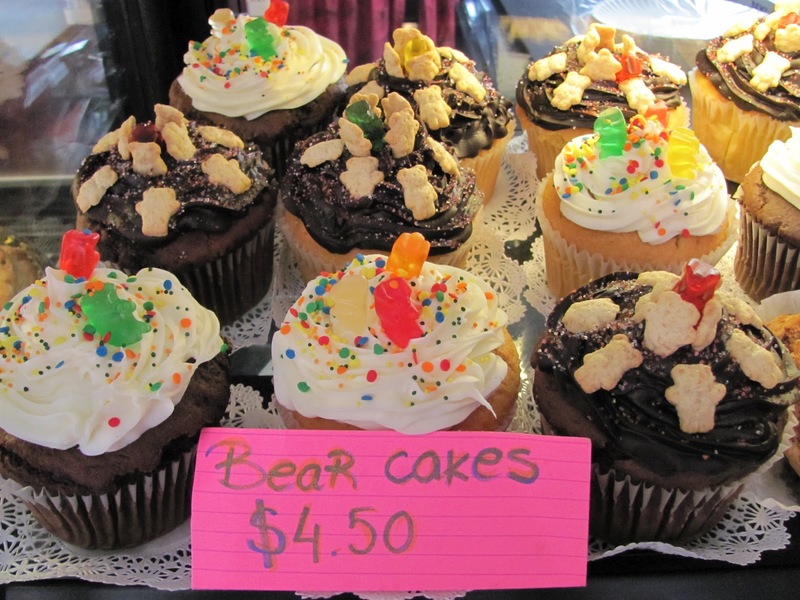 Red Eye Coffee is making giant cupcakes in various combinations of chocolate and vanilla cakes and frostings, decorated either with graham cracker teddy bears or gummy bears on top. The Bear Pride Flag, often seen in PTown, waves from many flagpoles and doorways this week, pointing out special deals, or just welcoming the group. The Bears also give back to the town each time they visit here, raising money to support the local non-profit organizations in this town that is so supportive of Bear culture. The Fireman's Ball and the Uniform Ball raise funds for our volunteer fire department and for other non-profits. 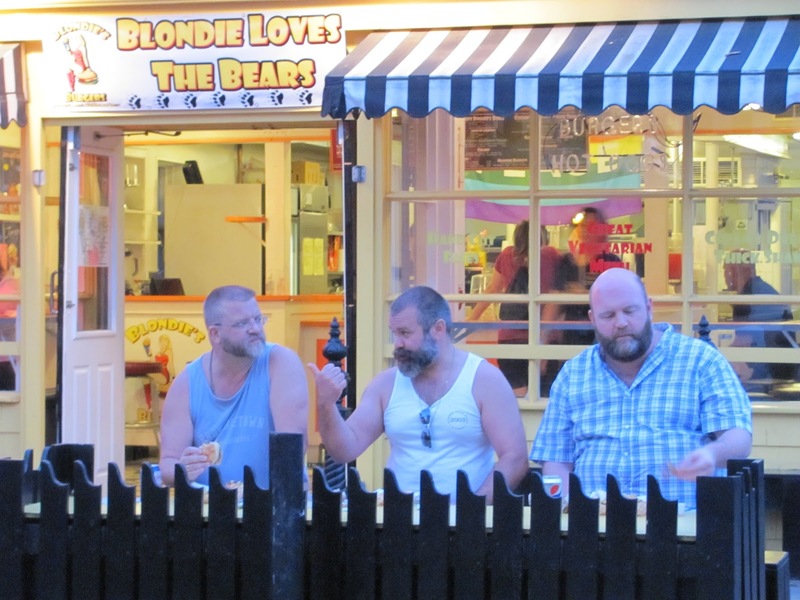 The first-ever screening of BearCity2, a romantic comedy about a Bear couple who come to Provincetown to get married during Bear Week, was held at Waters Edge Cinema, in the Whalers Wharf, with a special series of screenings continuing through Bear Week. See my review of this gem of a film by scrolling down these pages until you find it, or click this link to BearCity2. Here are a few photos from Bear Week 2012. We look forward to Bear Week every summer, and have enjoyed having this amiable group here again this year. So long, boys... Be careful, and come back soon. Since I've been writing this blog every day I've been carrying a camera with me everywhere I go, and sometimes the way I choose my topic for any given day is by flipping through the hundreds of photos now stored in my computer, and the number grows by another dozen or more every day. There's never a shortage of beautiful or interesting things to photograph here. The photo above jumped out at me from a garden on Bradford Street, where new, perfect blossoms had just popped out that day. The photo at the right came as I was having dessert on the back deck out behind Waydowntown. It was taken on a calm day in the harbor with a fairly high tide, in the few moments right before twilight where the water takes on that sort of pale violet color and the lighthouse out on Long Point lights up. The last whale watch boat of the day was sailing into port at the end of its sunset cruise. I got this photo as the whale watch boat, lined along its rails with passengers enjoying the last colors of the sunset behind me, came gliding into the harbor between the Long Point Light and the boats moored just off the beach. Here is legendary film director Roger Corman (Pit and the Pendulum, House of Usher, Little Shop of Horrors and fifty others) lounging comfortably on the stage at Provincetown Town Hall during the 14th Annual Provincetown International Film Festival last month. He is being interviewed by director and local legend John Waters just before receiving his award as this year's Filmmaker on the Edge. If you missed my blog about this year's film festival, you can check the archives section of this blog, or you can click this link to This Week's Hot Ticket - PIFF. 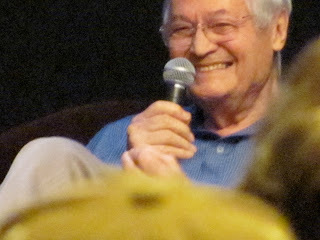 This was shot from my seat, way at the back of the hall, between the heads of audience members. I love this photo. It was taken at the breakwater in the West End on a day when there were several families exploring the tidal flats at low tide. Check the archives or click this link PTown Beachcombers Find Little Treasures to see the post that went with this photo. So put a camera in your own pocket. I've seen some remarkable photographs taken even with disposable pocket cameras. Capture a serendipitous encounter or the astonishing beauty of Provincetown as you make your way around the town. 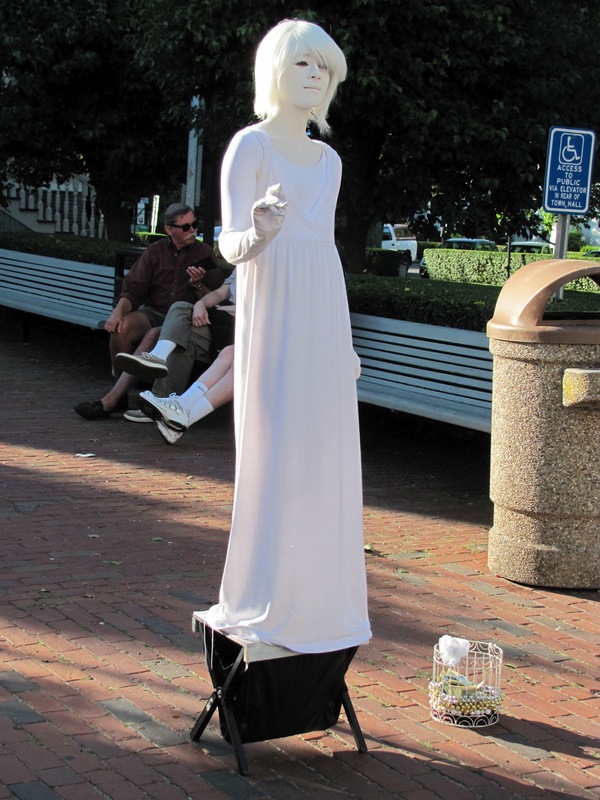 In the summertime, Provincetown will have a tremendous variety of street performers who have come to town to find an appreciative audience in the thousands of people swarming along Commercial Street every day. Street performers are often found in many spots along Commercial Street and in Lopes Square on Standish Street, particularly in the late afternoon and evening. Some performers are musicians, some make balloon animals or paint the faces of children, some don period costumes and portray historical characters, such as the pirates sometimes found in front of Town Hall with a big treasure chest to receive tips from people passing by. Others perform by being perfectly still, like The White Lady, standing absolutely motionless until someone puts a tip in the basket on the ground next to her, at which point she will reward the contributor, often by blowing a kiss, and then striking a different pose. She stands absolutely still, unblinking and unflinching despite the antics of kids trying to make her react. Thinking parents will stop their kids from harassing performers and use the moment to teach a bit about boundaries and respect for others, as well as an appreciation for all of the many forms of art that can be found in the world around us. The White Lady exhibits not only a remarkable talent for her chosen avocation but an admirable forbearance in remaining unfazed by those without the mental capacity to appreciate art when they encounter it. 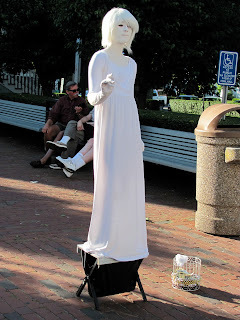 She and her boyfriend, the very tall man often seen holding court after-hours in the driveway of the Seamens bank parking lot, entertaining large crowds with magic tricks and illusions, each make their living by performing on streets all around the country. 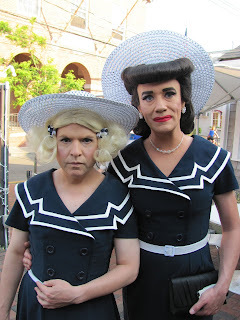 They have travelled to Provincetown this summer to enjoy some of the natural beauty that surrounds us, as well as to perform for the large crowds of visitors found on PTown streets on any given day of the summer. Street artists and performers enhance the landscape of our streets, enrich our lives with their performances, and bring more visitors to town as a result. 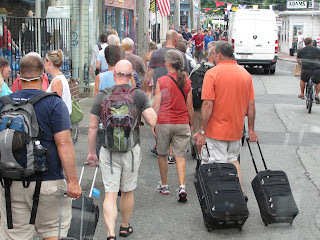 Some of these visitors name the diverse mix of street performers found here as one of the reasons they come to Provincetown. Look for these performers pretty much wherever there is a wide spot in the sidewalk, or any place where they can attract a bit of a crowd without interfering with the flow of traffic, like the driveway or front steps of the U.S. Post Office in the evenings, or under the tree at the old library at the corner of Commercial and Freeman streets. Watch for upcoming posts about a number of other street artists and performers in various spots around town. And the next time you run across a street artist, whether it might be a human statue, a pirate, a singer or a group of musicians, pause for a moment and be entertained, and be sure to leave a tip in the bucket, basket or guitar case. Above, in my introduction to this blog, I boldly proclaim that I can show you how you can find three meals a day in this town, and eat well, for under $35 a day. Here I will describe not only a favorite inexpensive dinner, but actually one of my favorite seafood dinners in Provincetown, at any price. The Seafood Grille's early dinner special, ordered before 7 PM, offers a three-course dinner with a choice of four different entrees for only $14. 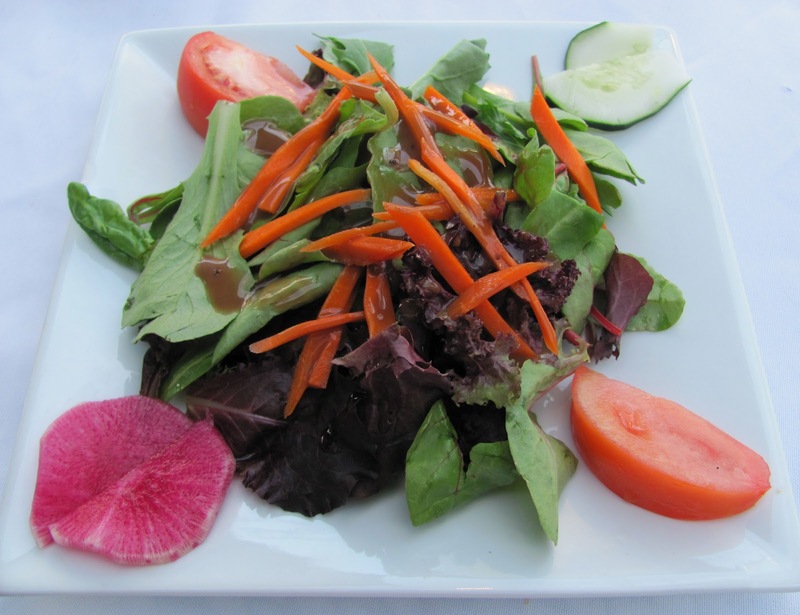 Dinner starts with your choice of a creamy New England style clam chowder or a lovely garden salad, which may vary occasionally depending on which varieties of fresh produce might become available that day. This evening it was a salad of mixed field greens garnished with slivered carrots, tomato wedges and cucumber, with slices of Watermelon Radish. The next course is your choice of four different entrees. I knew I would be coming here for dinner this night, so I already knew what I would order. 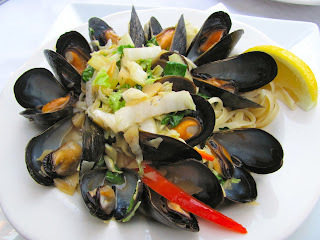 I spent my afternoon dreaming of the Seafood Grille's wonderful Asian Mussels, gently steamed to perfection along with ginger and Asian vegetables in a slightly sweet, absolutely delicious broth and served over a bowl of linguine noodles. 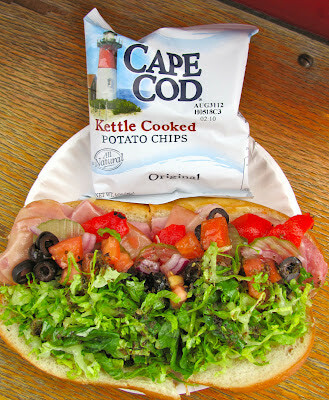 This is one of my very favorite entrees in PTown, and it's health-conscious as well. Dessert was a large scoop of vanilla bean ice cream drizzled with chocolate sauce and garnished with a sprig of fresh mint. They must have gone to the trouble of scooping the ice cream out just a few minutes early to let it warm just a bit, because it was that perfect consistency where it's slightly soft, smooth and spoonable, so I didn't have to to chase a hard rock of ice cream around the bowl with my spoon. You know... just slightly melty around the edges and the tiniest bit gooey. Perfect. For a dinner like this, you couldn't go to the store and buy the ingredients for $14. This meal definitely makes the list of Provincetown dinners that can be paired with a wide range of breakfast and lunch choices to fit into the 3 Under 35 list. Watch for upcoming posts combing this meal with breakfasts and lunches that will easily give you three meals for well under $35 for the day. And for its combination of wonderful flavors, and its excellent value, TheYearRounder names this meal a Best Bite. Raw Bar is a specialty here, too, with several varieties of fresh oysters every day to taste and enjoy. Did you know that just like wine grapes, oysters will take on different flavors and characteristics depending on where they are raised? Look for an upcoming post where I'l spend a bit of time with the oyster experts here to discuss the qualities of various varieties. When someone asked me the other day where to go for champagne and oysters on the half-shell, this is where I sent them. I can't seem to resist having a nice platter of raw bar selections whenever I dine here. They make it easy to do by offering special Raw Bar prices daily until 7 PM, so stop by yourself to taste a variety of different oysters you won't likely find anywhere else. Did you know that PTown has sixty-eight restaurants where you can sit down at a table for both casual and fine dining, and another two-dozen spots where you can grab something quick to take out? I do my best to get around to every restaurant in town at least once every year, but I could eat out every night for three months and barely make it around the town once, let alone return somewhere to repeat a favorite meal, or to try a new dish at a favorite restaurant. So I guess I spend a disproportionate amount of time at the Seafood Grille, along with a few other favorite haunts, but I can't seem to help myself. One day I'll write about Captain Lavender's rooftop tavern, and the charming 1860s guest house to be found here as well, hence the name Waterford Inn. Find all of this near the center of town at 386 Commercial Street, between Law and Pearl Streets. For dinner or guesthouse reservations, phone 508 487-6400. 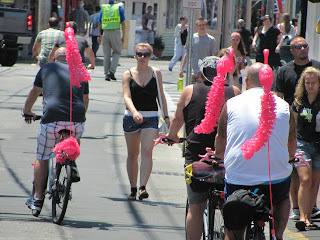 Provincetown is very walkable, being such a small town, but sometimes you need a ride. Or you might have something to carry. Maybe you want to go to the beach without having to drive or pay the parking fee. And if you came to Provincetown without a car, we thank you for that! The Provincetown Shuttle can take you just about anywhere you want to go, and you can even bring your bike with you. There's room for two bikes to ride along on the bike rack on the front of every shuttle bus. There are routes from the center of PTown to the Provincelands Visitors Center, Race Point Beach and the Airport; one to the Provincetown Inn and Herring Cove Beach, and one that runs along Bradford Street and out onto Beach Point and all the way to the campgrounds in North Truro, and you can flag down the bus anywhere along its route, or catch any one of these buses at the bus plaza, in the center of town, near the Chamber of Commerce and the public restrooms. 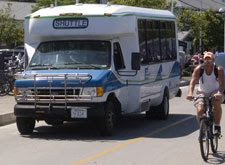 And new this year is the Outer Cape Bike Shuttle, pulling a trailer behind the bus, with room enough to carry about a dozen bikes and riders. It provides access to other bike trails beyond the eight miles of paved trails in the PTown area. This route has specific stops from Provincetown to Wellfleet, and it runs only on Saturdays and Sundays. All these bus routes are served by the fleet of the Cape Cod Regional Transit Authority. These buses come in various sizes and shapes, but they are always white with a bit of blue and green somewhere on the bus. They are all scheduled to leave the bus plaza (MacMillan Pier stop on the printed schedules) on the hour and the half hour, with most routes running daily until midnight. All rides are $2 for adults, $1 for kids, seniors and those with disabilities. You can get a money-saving pass from your driver. Click any of the links on this page to find fare and schedule information from the company's website. The fleet also includes the Flex Bus, running from Provincetown to Harwich, for access to Cape Cod Hospital and other destinations further up the cape. It runs every day in the summer, leaving PTown on the hour from 6 AM till 8 PM. 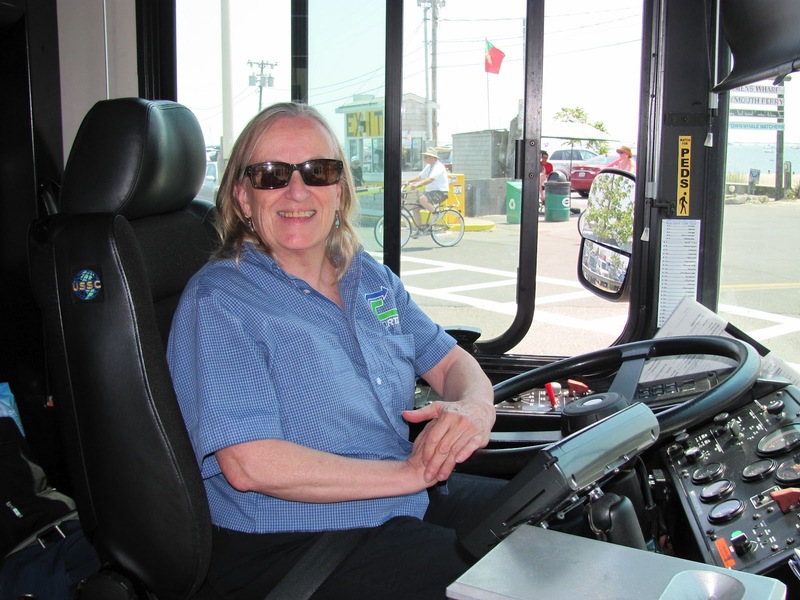 Judy Hogan was among the first drivers when the Flex Bus began running from Provincetown to Harwich about seven years ago, switching to the P’town shuttle route during the summers of these last few years. She actually prefers the route she drives in the summer, carrying her passengers back and forth between Provincetown, the resorts and motels on Beach Point and the campgrounds in North Truro. She says she enjoys bringing people from one happy place to another. These buses make it pretty easy to get wherever you want to go in the summertime, and using the bus saves fuel and decreases air pollution as well. So rather than driving, or taking a taxi, take a bus that's already going to your destination. Mother Nature will thank you for it, and we'll all breathe easier. 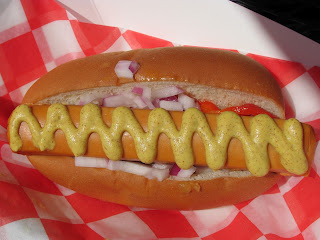 I had been craving a hot dog all day long; the flavor, the "bite," the soft texture of the bun, the way my mouth waters a little as I bite into a few chopped onions... There’s nothing like a good old American hot dog. Trouble is, I really don’t eat things like that anymore. I may have a hot dog three or four times during the year, down from three or four a week in summers gone by, dashing from one job to the next. I’ve pretty much given up eating anything that still has all those nitrites and other poisons. I was so happy to find out that the dogs at the Lucky Dog have no nitrites, no chemicals, no poisons typically found in most hot dogs, and yet they’re still really tasty. They offer all kinds of specialty toppings, too. Even so, I still will only eat a few a year because I’m not eating nearly as much meat these days, so the Lucky Dog made me happy again when they told me they had a tofu dog, gluten-free and made of soy. Now before you turn your nose up and make a face, these are really quite good. The flavor and texture aren’t far off the mark, and a lot of people really wouldn’t be able to tell the difference. So when my hot dog craving came creeping up this morning as I was passing through the convenience store where the dogs were already sizzling on the grill at 9 AM, I was barely able to resist the primal urge to boof one down. Later in the day, when I was still thinking about those rows and rows of juicy malevolence rolling endlessly on the glistening stainless steel rods of the self-serve wienie machine, I remembered the tasty, meatless dogs served at the Lucky Dog. So I headed over, knowing that their tofu dog with all the trimmings would allay my pathetic yearning. I got my beautiful little pseudo-sausage drizzled with a bit of spicy brown mustard, a little relish, some chopped onion, of course, and some roasted red peppers. A gourmet ingredient or two keeps me from feeling deprived when I make a healthier choice. So I was happy as a clam, eating my delicious dog, but the real treat of this visit, it turns out, was yet to come. I saw the counter top display of Hal's Cornmeal Lime Summer Cookies, and I knew I needed to try them. WOW! These are some of Provincetown's best. They were big and tender, perfectly baked cookies with a texture a bit like a sugar cookie, but lighter somehow, despite being made with cornmeal, and not as dense or sweet or heavy as your typical sugar cookie. They were just a little sweet, with a topping that was somewhere between a thin icing and a confectioner’s glaze, with the sweet/tangy flavor of fresh lime juice and the finely grated zest of the limes as well. Again, WOW! These were the best cookies in recent memory, which is saying a lot considering the Girl Scout cookies made their annual appearance here not that long ago. The Thin Mints and the Tagalongs have nothing on these Cornmeal Lime Summer Cookies, which rank among the best I’ve ever tasted. 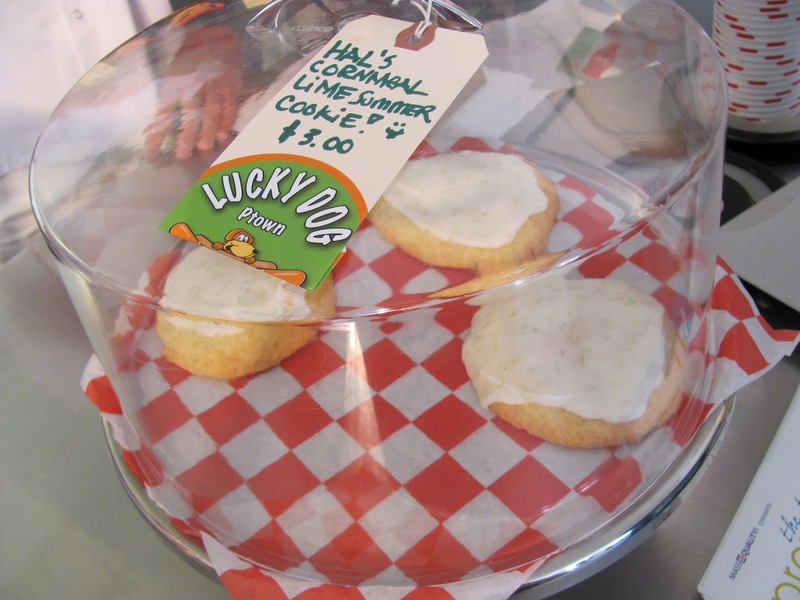 TheYearRounder chooses these cookies, fresh from the Lucky Dog kitchen, as a Best Bite. Find the Lucky Dog behind 293 Commercial Street, down the little footpath next to Cuffy’s, or go to the bus plaza and you can see them from there. Look for the beautiful new mural of whales painted on their building. Low tide can expose all kinds of treasures along the shoreline of Provincetown, which runs about 20 miles along the edges of Provincetown Harbor, Cape Cod Bay and the Atlantic Ocean. There are two low tides and two high tides in a period of approximately 25 hours. So if low tide occurs at, say, 4 PM today, tomorrow afternoon it would be just before 5PM. A tide chart will come in handy to help you choose the time for your walk along our shores. Anywhere along the beaches of Provincetown you can find seashells, pebbles, and on the edge of the harbor, sometimes bits of pottery from some of the earlier days when there were ceramics workshops in town, along with countless other little treasures. Shells of clams, mussels, scallops and oysters, picked clean by the seagulls and other scavengers, are found in many spots. Very large clam shells are sometimes found on Race Point Beach, along the edge of the Atlantic Ocean, along with occasional lobster buoys, pieces of driftwood and other, larger gifts from the sea which sometimes wash onto the shore with the waves and tides. On rare occasions, and on calmer beaches like the shoreline of the bay or the harbor, you might find something valuable, like old coins, jewelry or other items dropped on the beach in years gone by. Bits of sea glass, the shards of broken bottles worn smooth over many years of washing in and out with the tides, are becoming quite scarce, but still turn up once in a while. And sometimes just a simple little rock with a nice design, worn small and smooth by washing up and down the beach for a couple of hundred years, is just the right keepsake to remember a special day exploring the beaches of Provincetown. Although Douglas Langway's new movie BearCity 2 is scheduled for its world premiere in Los Angeles later this month, its very first theater showing was here in Provincetown last night, at the new Waters Edge Cinema, on the second floor of the Whalers Wharf, at 237 Commercial Street. It's only fitting, because Provincetown is a lead character in this movie. The film continues the adventures of many of the characters we met in Langway's prequel to this film, the very popular BearCity. In this sweet romantic comedy, New York City Bear Roger (Gerald McCollouch) and Cub Tyler (Joe Conti) decide that, now that it's legal for New York couples to get married, they'll go to Provincetown to tie the knot. 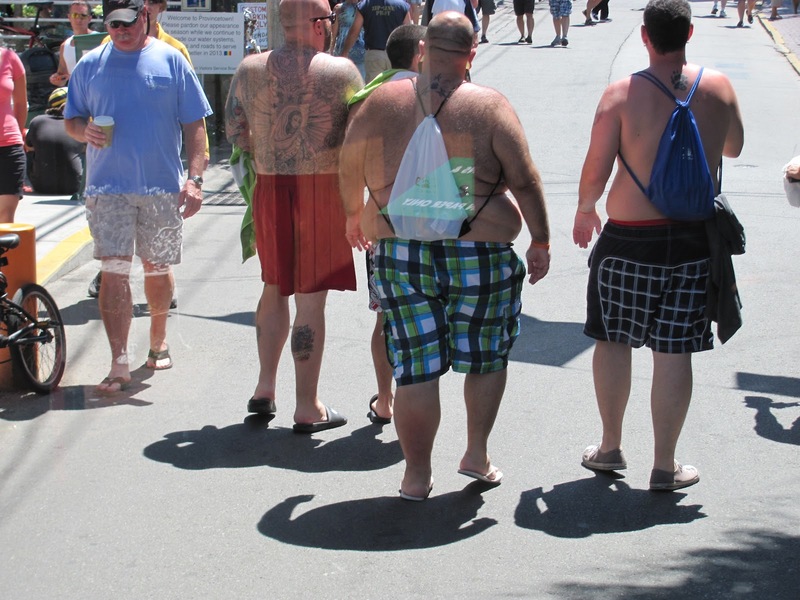 So they and all their friends head off to Ptown, right in the middle of Bear Week. 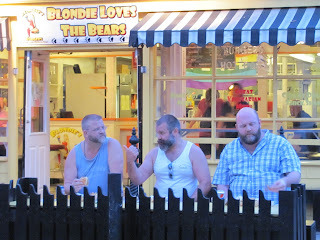 Of course, not everything goes as planned, and in the midst of the hundreds of Bears who have gathered in Provincetown, as you would imagine, old lovers turn up left and right. Fred (Brian Keane) and Brent (Stephen Guarino) have a few problems of their own, one of them being that Brent's mom, Rose (Kathy Najimy) thinks Brent deserves someone more attentive and committed than Fred, and she says so. This film is quite satisfying, with a good mix of comedy and drama, an enthralling story line, a funny, well written script, great cinematography and good acting throughout. It plays through July 14th at Waters Edge Cinema, at varying times each day, so call 508 487-FILM (3456) for schedules. Tickets are $12 for all tickets. Your film society membership doesn't help you this time. Tickets are available online at http://www.watersedgecinema.org/, but I tried no less than eleven times with no success, so if you have trouble buying tickets online, go early to the theater. The box office opens a half hour before the first show of the day, with tickets on sale for any show that day. Tickets may sell out during Bear Week, so get yours early.